Whether or not you're coming to The Sound of Young America Live! on Saturday at the UCB in New York, you can join us for our meetup. We'll be meeting at 7:30PM at The Peter McManus Cafe, 152 7th Ave. The "cafe" (more of a pub) has both food and grog. I'm scared of the new David Simon series. The new mini-series from David Simon, creator of The Wire, premiers on HBO July 13th. It's called "Generation Kill," and it tracks a group of marines through the first 40 days of the invasion of Iraq. I am terrified to watch this show. 1) It is not as good as The Wire, and thus is a terrible dissapointment. 2) It is as good as The Wire, and what little is left of my soul is crushed. If you're in the LA area, Intern Chris and I would love to have you as guests at MaxFun HQ on Sunday, June 22nd. We'll be hanging out, eating awesome snacks... and packaging t-shirts and posters from the Max Fun Drive. If you'd like to hang out with me, Chris and Cocoa, and enjoy some delicious treats and refreshing beverages the afternoon of the 22nd, email Chris at chris at maximumfun dot org. A couple hours of your weekend would make our lives immeasurably easier. And there's gonna be snacks. Did I say snacks? Snacks. Courtesy of Punchline Mag and Rooftop Comedy. That Tig Notaro is hilarious. Chris Farley burned brightly as a comic actor, rising quickly to enormous fame as a television and movie star. Unfortunately, he also crashed and burned. 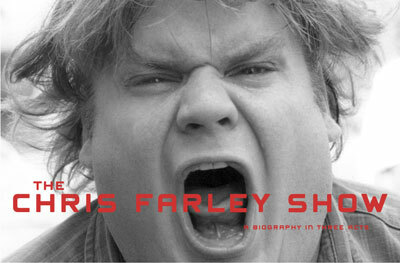 Writer Tanner Colby and Farley's brother, Tom Farley, have collaborated to tell Chris' story through the words of those who knew him in the book "The Chris Farley Show: A Biography in Three Acts." We talk with Tom and Tanner about the life of this gifted and troubled comic. We're thinking Podthoughts about three alt.NPR podcasts this week. First, B-Side Radio [iTunes link]. The key to this show is that This American Life is side A. Modulo a nuance or two, the programs share a format: a few "real people," sometimes the producers of the show itself, share stories, each related to a theme. The most obvious differences between B-Side and Ira Glass' juggernaut is that B-Side comes out monthly rather than weekly, contains (on the average) more stories per minute, and covers topics of slightly less consequence. That's not necessarily a bad thing — TAL's production tends to inflate the importance of its stories, which makes me cringe — but one must be in a certain state of mind to appreciate a cop who impersonates Fat Elvis on the side [stream], Mexican teen moms [stream] or video game nerds [stream]. I'd be lying if I said I wasn't puzzled as to why B-Side appears to have no higher aspiration than to be the junior varsity version of public radio's hippest, youngest show — average listener age: a spry 47! — but that modest ambition is more than enough to satisfy public radio addicts like you and me. What Would Rob Do? [iTunes link] is a biweekly examination of "life's most trying dilemmas" from Rob Sachs, a producer and director on Tell Me More. It's a slightly less focused affair than it sounds: the dilemmas in the purview of Rob's assistance include staining your shirt (useful! ), clogging a friend's toilet (useful! ), getting trapped in an elevator (still pretty useful! ), and, uh, auctioneering. A better title might be Who Would Rob Consult? : since his own knowledge seems unsuited to address any of these situations, Rob interviews experts to get the answers, as when he rings up Michael "Let's Get Ready to Rumble!" Buffer for advice on coming up with a catchphrase. This reduces Rob's own role to that of a goofy middleman, peppering his delivery of the information with an occasional corny remark, but he gets better at it every time. His conversations with whichever co-host happens to be around (sometimes Jordan, Jesse, Go! guest Mike Pesca) used to sound uncomfortably stiff and scripted, but they've become much more delightfully off-the-cuff with time. Brini Maxwell strikes me as very much a Maximum Fun sort of homemaking guru, in that she's (a) satirical, but somehow simultaneously sincere and (b) a man in drag. The character gained traction on Manhattan public access television, segments of which program are available as a a vidcast, and then spent a couple years on the Style Network. Her current podcast project, alt.NPR's Brini Maxwell's Hints for Gracious Living [iTunes link], provides about five weekly minutes on the finer points of, most recently, making stew, making cheese, making friends who eat brunch, and making furniture (or at least talking to those who do). Unlike most forms of entertainment involving drag, Brini's show is both practical and not loaded with bad disco. Though the program's content runs thin at times, Brini's imitation of the late-50s through early-70s lifestyle aesthetic hits dead-on. Stay tuned — more coverage of alt.NPR podcasts is on the way in a future installment of Podthoughts. The Sound of Young America is Live! in New York City on Saturday afternoon as part of Sketchfest NYC. We're so happy to have Ze Frank, Jay Smooth, Pangea 3000 and Dawn Landes to entertain you. Tickets are available now, so buy yourself some. And tell a friend! Watch through the end, and note that Al Green and David Letterman are in love. OH HOW I WOULD LIKE TO MAKE THAT A LOVE TRIANGLE! TWO OF AMERICA'S GREATEST MEN AND ME, LOVING EACH OTHER AS BROTHERS! PLEASE GOD MAKE MY DREAMS COME TRUE. Thanks to BV for hooking this up.